It employs a case of large, from GA-150 series of tough dynamic design carved like a lump of resin, was subjected to metallic color appearance models. Band from the bezel, metallic color to adopt the character of the bowl-shaped plate with a sense of strong and solid. In addition to the sense of rigid metallic, was finished in tough new design. It also provides practical measurement with stopwatch 1/1000 sec, the performance also in terms of functionality JIS1 antimagnetic species. 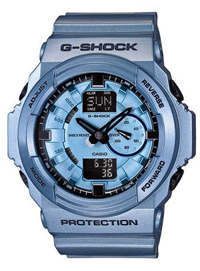 New design is a tough case of the big G-SHOCK series shine on the street fashion scene.